The defence secretary has claimed that no other industry has as much certainty as shipbuilding on the Clyde. Sir Michael Fallon said order books would be full until 2035, guaranteeing 20 years of work. His words follows comments from a Unite union shop steward that he was "not sure" he could trust UK government promises on future orders. Duncan McPhee said ministers had changed strategy and cut the number of ships to be built on the Clyde. 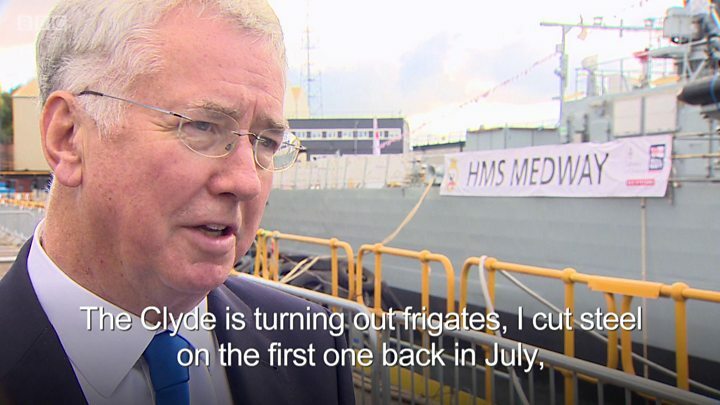 He was referring to an expectation that a contract for five Type 31e warships would be built by BAE Systems workers at the Clyde's Scotstoun yard. However, ministers now want the frigates to built in blocks at yards across the UK before being assembled at a central hub. Sir Michael said that workers at BAE Systems on the Clyde were already building eight Type 26 frigates, along with five offshore patrol vessels. He was attending the official naming of the second offshore patrol vessel, HMS Medway, in Scotstoun, where his wife, Lady Wendy Fallon, was the ship's sponsor. The defence secretary said: "No other industry in Britain has as much certainty as those who work in shipbuilding. "There's 20 years of work guaranteed for the Clyde now." Sir Michael said that BAE Systems had teamed up with the UK's largest shipbuilder, Cammell Laird, to bid for the new Type 31 contract. "It will be a powerful bid, combining the skills and expertise here with Cammell Laird. "But there will be other bidders as well, and other yards, but I expect a very strong bid from BAE-Cammel Laird and that means the skills here on the Clyde will be re-employed again." He said. Union representatives had said they hoped to speak to Mr Fallon about the future of Scottish shipbuilding during his visits to Scotstoun and the Ferguson yard in Port Glasgow. Speaking ahead of Sir Michael's visit, Duncan McPhee from Unite the union, told the BBC's Good Morning Scotland programme: "The national shipbuilding strategy has changed. This work should have been concentrated in Glasgow." Mr McPhee said workers on the Clyde had initially expected to build 13 Type 26 frigates, but this number had been reduced to eight. He added: "The government is trying to introduce a failed policy for complex naval ships, which is to have open competition within a country. "None of our peer countries do that - France, Italy Spain, Germany, certainly the USA. They have what is called a National Champion to provide complex naval ships. "We had this failed policy in the past. If we go back to the 1980s, we had internal competition where shipyards went bust taking on contracts that they couldn't deliver." Sir Michael said he was "very happy" to talk with the unions about their concerns. He added: "Twenty years of guaranteed work is something no other industry has and the Clyde is going to do well out of a growing Navy, building the heavy frigates, part of the carrier and they have every prospect of putting in a strong bid for the light frigate." The formal procurement competition for the new Type 31e frigates will open in the new year.